Sam has some unusual characteristics. He's small for his age, especially since his parents had him moved ahead to 8th grade at the beginning of 6th. ; His father seems to think he will go to MIT and be a famous scientist, but Sam just wants to cook. His family runs Lily Putt, a putt putt golf course, where he and his father often hand out wearing kilts, not usual garb for Texas. He was also "the boy in the well" and the community has not forgotten that when he was four years old he spent three days stuck in a hole. He does have a good friend, Karim, but is leery of James Jenkins, who was there during the well catastrophe that left Sam with an understandable claustrophobia. James is also there to save Sam when he is pushed into a locker by 8th graders, and the two slowly warm up to each other. Sam is determined to enter the town cooking contest, and he finds out that James, whose father owns a local restaurant and is bound and determined that James plays football, is an excellent ballet dancer. The two try to work toward showing their families that they are very successful at what they do; it's just not what their families WANT them to do. Strengths: I enjoyed reading about how hard it was for Sam to be skipped ahead two grades, and was glad he had a good friend in Karim. James was a very intriguing character, and his never-smiling, nodding demeanor was spot on for an 8th grade boy! The two have a very realistically evolving friendship, and even their past problems are worked in well. There are a lot of weird but funny moments-- survival camping with the father, time at the putt putt course, a school dance, and the fair at the end of the book make this a fairly amusing read. Weaknesses: There are a lot of chapters that are flash backs to when Sam was in the well, where he was befriended by a talking armadillo named Abernathy who helped him survive. These sections were rather strange, and didn't really add anything to our understanding of Sam and his problems. This was somewhat reminiscent of the hallucinatory scenes in Karen River's The Girl in the Well is Me, which many people liked. What I really think: I'm going to ask some students about this one. 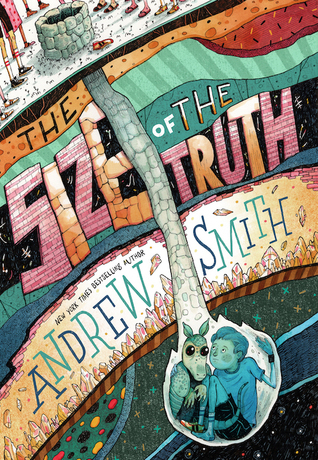 I really like the parts of the book that did not have the armadillo in them, but I would like to know if middle grade readers will dislike that part as much as I did.